As Salt Lake Community College students focus on the beginning of spring semester, many forget to map out their path to graduation. There are specific requirements, both in general studies and department-specific certifications, that students fail to give much importance to. This can waste time and money. The following is a collection of reminders a hopeful SLCC graduate should prioritize so that they may have a successful experience with their degree completion. In any college experience, knowing what deadlines apply to your long and short-term goals is vital to keep yourself and your plan on track for graduation. It is ideal for new SLCC students to already have a two- or three-year plan in place so that they may complete their desired program in a timely and productive manner. Students who expect to graduate this semester have until April 28 to submit all paperwork and fees for completion of graduation. It is important to note that there is a difference between graduation and commencement. To graduate from SLCC, a student fulfills course expectations, completes appropriate paperwork, and then pays a fee. Commencement is the ceremony held at an off-campus venue in which graduates will walk and receive their diploma. There is only one commencement ceremony held every year during the spring semester, so students who expect to graduate in the fall should keep that in mind. Many a SLCC student grows all too comfortable in their school routine and will often underestimate the importance of meeting with an advisor. Students who have their minds set on a specific degree can meet with an academic counselor that will be able to more appropriately address the questions and concerns of that student in their respective department. Slade Huger, an SLCC communication grad, admits that because he did not meet with an advisor he made a serious miscalculations during his time at the college. Learn about online advising available at SLCC. Those who have not yet decided on a degree or program to pursue can meet with any general advisor. 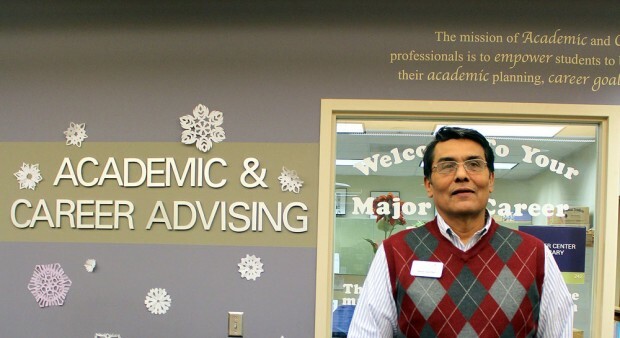 While appointments are strongly encouraged, students are also able to walk in to one of the many advising offices available and sign up to speak with an advisor on the spot. Though face-to-face meetings are an initial priority for most students, others may just need a quick peek into their progress — perhaps one that is just a click away. DegreeWorks is a tool that gives SLCC students a real-time look into their current progress and what they have to complete in their intended program. It can be accessed from MyPage. Those pursuing an associate’s degree in a particular department will be able to see what they have completed in terms of their general requirements and degree-specific requirements. Regardless of the declared program, every student is able to see their grade point average and can even produce their own “what-if” analysis. This analysis is a projection into what the student’s progress would potentially be if they declared a different degree at SLCC. Because many SLCC alumni will go on to attend a four-year college, other major institutions across the state of Utah consistently visit SLCC campuses during so-called Transfer Days and other events. Former SLCC and U of U student Hannah Snow has firsthand experience with the transfer process. Transfer Days allow a variety of departments from one school to visit an SLCC campus. Students can get advice on preparing their future semesters to satisfy current responsibilities and make headway with their potential university plans. Some schools, like the University of Utah, will also have regularly scheduled one-on-one meeting opportunities for SLCC students, making it easier for them to have their questions or concerns addressed without having to leave campus. Any student who has questions about graduation, the transfer process, or meeting with an advisor can call 801-957-4978 for more information.